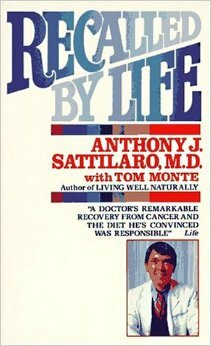 This book is an autobiography of Dr Anthony Sattilaro, MD as told to Tom Monte. Dr Sattilaro graduated from Rutgers University and the Harford Hospital and also a graduate from the Harvard Business School and School of Public Health. He was an anesthesiologist for 20 years until his appointment as the President of the Methodist Hospital in Philadelphia in December 1977. In June 1978, at the age of 47, Dr Sattilaro was told by his physicians that he had prostatic cancer (stage 4) which had metastasized to other parts of his body, including the skull, shoulder, spine, sternum, and ribs. Within weeks of the diagnosis, Dr Sattilaro underwent surgery and began estrogen treatment to combat the spread of the disease. As a last resort, he even removed his two testicles. It soon became apparent, however, that this would not halt the malignancy. His doctors informed him that he had perhaps “a few” years to live (Later, he was told “less than 18 months”) and that those years would be spent in a torturous slide towards death. He was already suffering from acute back pain, for which large doses of painkillers provided only periodic relief. His highly professional colleagues have left little doubt that he had terminal cancer, and he resigned himself to a painful future, a regimen of drugs, and only a slim hope that he would live to see fifty. Driving back to Philadelphia after the burial of his father, who had died of lung cancer, Sattilaro was deeply depressed and uncharacteristically picked up two young hitchhikers. At a loss for small talk, Sattilaro confessed that he was living on borrowed time, and to his surprise he was told that his illness is curable if he would go on a strange vegetarian diet. Though highly skeptical, he was intrigued by the young stranger’s sincerity, and with nothing to lose, he followed up the lead. Dr Sattilaro had been a doctor for more than 20 years by then, and it was with no small trepidation that he went looking for answers outside the profession to which he had dedicated his life. This search put him on an extraordinary journey—one that has led him not only to a restoration of his health, but also to the roots of his being. While still continuing his duties at the hospital, he rearranged his life to take his meals at a commune where only such foods as brown rice, whole grains, beans, fresh vegetables, fish and seaweed are served, and where a positive, spiritual approach to life was pervasive. In just a few weeks, the back pain that had plagued him for years subsided, and in a matter of several months the course of his cancer had been reversed and his body was actually on the mend. On August 6 1981, Dr Sattilaro underwent another bone scan at the Methodist Hospital, the sixth test he had undergone in the past 3 years. That bone scan revealed absolutely no sign of cancer in his body. The news of his X-rays hit the macrobiotic and medical community in Philadelphia as if Dr Sattilaro had been raised from the dead. He had not resumed the estrogen therapy, even for a short period, since he quit the hormones in June 1979. However, doctors in the Methodist Hospital insisted that Dr Sattilaro’s improved health was due to his previous surgeries and the estrogen therapy and had nothing to do with the macrobiotic diet. Dr. Sattilaro admitted that he could find no medically acceptable explanation for his cure; he knew only that it had happened. He continued to support established methods and procedures of modern technological medicine, but his experience suggested that there are complementary approaches to health, and especially to cancer, that may also be beneficial. He began and ultimately found not only a cure but a sense of wholeness and spiritual fulfillment that he shared with the reader in this account of his remarkable experience. Dr. Sattilaro celebrated his 50th birthday in 1981. The diet Dr Sattilaro followed is called “macrobiotics” which is drawn from the best elements of a traditional Asian diet, including generous amounts of rice and vegetables. (There are a lot of books/literature written on macrobiotics and cancer—just Google for more information). As he recovered, he became perhaps the most famous advocate for the use of diet against cancer and this raised the question as to whether diet can turn the tide on cancer, and the fact that there was simply not enough information yet available to speak with assurance. There were no double-blind studies, no control patients, or anything else that would suggest that what happened to Dr. Sattilaro will happen for anyone else, although there is a large cadre of people who report similar results. Dr Sattilaro’s story of his prostate cancer being healed by a change in diet created a big storm. This led to some serious debates. Dr Neal Barnard, MD and nutrition researcher became interested in Sattilaro’s story. So he went in search of him in 1986. Dr Sattilaro had resigned his job as head of Methodist Hospital and had moved to Florida. He was not only alive, but youthful and vigorous. He had adhered to the macrobiotic diet and adopted a specific exercise program. He went swimming every day. His cancer seemed to be gone, and he kept X-ray films in a file for when he needed to remind himself of his remission. Sattilaro had been deluged with letters from other cancer patients, but always answered that he did not know if what had happened to him could also happen for them. Eventually, he began to deviate from the diet, adding fish and chicken, as if to test whether he was cured or simply in remission. If it was a test, he failed. In July 1989, Dr Barnard called Dr. Sattilaro and found him to be gravely ill. His cancer had recurred—”viciously,” he said. He was in good spirits, but harbored no illusions about the grim situation he was in. He knew that the end was very near. He had resumed the use of painkillers, which at times made him quite groggy. Dr Sattilaro died shortly after. However, he survived 11 years despite being told he had only 18 painful months to live. If he had not been too adventurous with his food after his 10th year, would he have survived longer? We will never know. The food that I had lived on for the previous 47 years was rich and usually heavily seasoned. I lived the perfect formula for cancer—a high fat diet, plenty of refined flour products, an insatiable sweet tooth and a generally sedentary lifestyle. When the hitch hikers told him that cancer is the natural result of a bad diet, Dr Sattilaro wondered how a 25 year old knows about cancer. He then dismissed the hitchhiker’s statement as foolishness of youth. After 25 years of practicing medicine, he had heard all kinds of quack claims and treated them with the same kind of dignified disinterest. When he went to the Macrobiotic center, he was told that he has to abstain from…all meat, dairy products, refined grains, including white bread and flour products, all sugar, all oils, nuts, fruits and carbonated drinks and foods containing synthetic chemicals and preservatives….which was Dr Sattilario’s standard fare to the letter. He left the Macrobiotic centre feeling a deep sense of confusion and despair. He felt as if he had just walked out of another world. Going there and being given an examination by a thirty-year-old kid who hadn’t been to medical school was surely reaching the bottom of the barrel. Despite his deep skepticism, Dr Sattilaro nevertheless opted to give the macrobiotic food system a try. He had nothing to lose as his life was declared terminal and he was living on borrowed time. Each day, Dr Sattilaro carried to work the little Japanese lunch box containing brown rice and vegetables. People at the hospital looked at him with a combination of curiosity and pity. There was also a strange disappointment in their eyes, as if he had gone over to the other side already. “He’s turned himself over to the quacks” many of them must have thought. He said he would have thought the same thing, had a colleague of his resorted to macrobiotics in his dying days. How Dr Sattilaro reacted to Macrobiotics. About 2 weeks after he started macrobiotics, he developed symptoms of a cold or flu with heavy mucus discharge and a mild fever. He was told that this healing reaction is “sickness of adjustment” which is the body’s way of getting rid of excess on a periodic basis….this bewildered him further and heightened his skepticism. His perception changed when on September 26 1978, he discovered that his back pain was gone. He had suffered 2 years of enormous back pain that only heavy doses of narcotics could put down. Within a few weeks after he began the macrobiotic diet, his digestive problems disappeared. On top of that he had great reserves of energy and his mind seemed clearer than usual. 1) THE MACROBIOTIC DIET IN CANCER. 3) THE MACROBIOTIC PATH TO TOTAL HEALTH by Michio Kushi and Alex Jack (A complete guide to naturally preventing and relieving chronic conditions and disorders). 5) COOKING THE WHOLE FOODS WAY by Christina Pirello (Everyday guide to healthy, delicious eating featuring 500 vegan dishes). 1) What is the Macrobiotic Diet? Dr Barnard is a nutrition researcher and founder of The Cancer Project and The Physicians Committee for Responsible Medicine (PCRM) which promotes preventive medicine, especially good nutrition, and addresses controversies in modern medicine, including ethical issues in research. Dr Barnard is an adjunct Associate Professor of Medicine at George Washington University and is the author of the best seller “THE CANCER SURVIVOR’S GUIDE” featuring foods to fight back cancer—with special emphasis on Prostate and Breast Cancers.